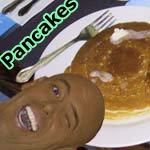 This recipe for Pancakes was submitted by scrambler on 5/5/2002. Click here to view the recipe. To get the right batter consistency, I needed more milk than listed. I just kept adding more little by little until the batter drizzled off of the whisk. I also added 2 pinches of salt and a 1/2 teaspoon of vanilla. With those adjustments, this recipe was pretty good. I've made these before according to the recipe and if you spread the mixture out with a spoon in a circular motion or rotate the pan as the directions say, it will make the pancake thin. These are not supposed to be crepes. They are supposed to be crepe-like. Tried this recipe yesterday, and the milk quantity is wrong. I used almost 3 cups of milk instead of 1 to make them as thin as they should be. Please can you correct the recipe as when people find it they don't read all the comments and reviews (I didn't) and they'll be disappointed when it doesn't work. Thank you. The numbers are reversed. It should be one cup flour and two cups of milk. French crepes are thin, and are not called pancakes. This is NOT a crepe recipe. It is a French pancake. Different things. Try the recipe by Schmitty in the comments here. It turned out absolutely perfect. Thanks Schmitty! Use 3 cups of milk instead of one. They are supposed to be thin. This recipe is WRONG! Either there is too much flour or not enough milk... Anyway, if you follow the above recipe you end up with something that looks more like Aunt Jemima''s pancake mix then crepe mix... If what I have is "thin" then I don't understand the definition... This recipe isn't correct... Don't follow it! This was an awesome recipe. They are similar to crepes and great filled with sweet cheese (a traditional Polish crepe is filled with farmers cheese mixed with egg yoke and sugar). 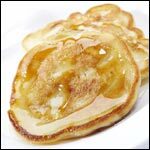 I have been making French pancakes for many years and I will give you the correct recipe and the right way to make them. First of all, the french word for pancakes is crepes so they will be very thin compared to American pancakes. We spread a thin layer of butter on them and then sprinkle them with sugar and they are wonderful. You can also use fillers such as jams,and roll them up or just use syrup. It is really just a matter of taste but everyone we have made them for has liked them with butter and sugar. These pancakes will be as big as your plate and are very filling, however, they are so good I always eat two. Okay, let's get to the recipe and directions. Melt butter on griddle then pour enough batter to simulate the size of your plate. Turn when golden brown on bottom side of pancake. When ready to serve spread a thin layer of butter on pancake and sprinkle with sugar. Yummy, yummy, yummy.....so good for the tummy! 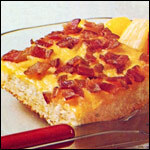 This entree breakfast was soo awesome it turned out great with apples in it... I thought that this wouldn't work out great because since I'm only 12 years old but the crepe turned out awesome. If you follow the above recipe it is terrible because they turn out like regular pancakes and are tasteless. You need to add 3 cups of milk to make them thin like a crepe and add a little more sugar, some vanilla and salt. Then they are edible, but I still won't make the recipe again. Works best with 3 cups of milk and try putting vanilla or chocolate pudding on top my family loves them. This worked out great and I shared them with my whole class... I'm only 11 but I think this is a perfect way for kids my age to start cooking 10 out of 10 for me!!!! Great with powdered sugar and a little lemon for topping and yes it does need a little more milk than ingredients say. Thanks. Worked great with a little more milk. Recipe is all wrong. way too much flour. use half that amount, add vanilla, get mixture real thin, pour on thin, cook till golden, add syrup, rool up and walaaaa! Awesome! We added a touch more milk to thin the batter per the comments. Sorry, I am French and this pancakes is not awesome les fran�ais les font mieux vous etes trop nul - car vous etes am�ricain mdr. Just need to add more milk to thin them out!! Then they are just great! I love this breakfast. It is so good. I was very pleased with this recipe. It was easy and everyone liked it. This is the best breakfast recipe ever. Very awesome. Don't expect them to be thick like American pancakes and you will be very happy with the results. I like them a lot more than classic American pancakes. Makes good smallish pancakes. Fire 3 at a time on a 12 inch pan. This recipe is mad, dawg. But I'm wondering what the heck the French word for pancakes is. I thought it over again. I think the quantities of flour and milk could be mixed. Try two cups of milk and one cup of flour. A little vanilla is also nice. 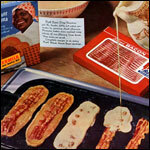 Very good, but you have to add more milk... plus, you have to shake it around on the skillet. In my experience you need more milk than flour to make decent crepes. Liz's idea sounds about right. Regarding the recipe for French Pancakes. I have made Fr. pancakes before and tried your recipe, you just need to increase the milk to 2 and 1/2 cups in order to make the batter thin enough to turn in the pan. The mix for the french pancakes is more thick than it is thin. 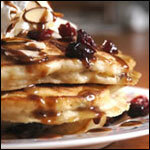 It is really tough to make a thin crepe-like pancake from this recipe as well.